A cool thing about working on websites for a living is that you get to see so many great concepts and innovations that are available on many different ecommerce sites. Our clients are awesome and their products are really amazing. A great example of this is the Rogers Family Company. They have been a long time customer of ours and our internal joke is that before working on their site, barely anyone in the office drank coffee. Now at least half of the office can barely get going without our morning cup (or cups) of coffee or tea! Recently, they released a new product that we thought you’d enjoy hearing about as well. We love coffee and we love going green and when we discovered that Rogers has developed a 97% biodegradable Single Serve Coffee we were pretty excited. 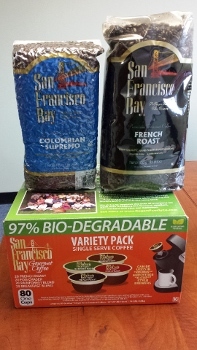 Many of us use the single serve coffees at home and were always bothered by the waste associated with this convenience. Check out the article below to learn more about this product. This is just one example of the many ways our customers are providing people with the things that they desire. We’re glad we can help them make those products available for you on their websites! Keep up the great work! This is the first, of what we hope to be regular installments, of innovations that hit home with us. If you are one of our clients and have something new and exciting that you’d like to share with us, please let us know. If you aren’t a client and would like some help getting your great ideas out there, don’t hesitate to contact us! Thanks again to the Rogers Family for your continued support over the years. This entry was posted in Blog, Ecommerce, Featured Client on August 29, 2014 by Carrie Saunders.